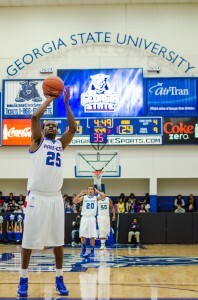 Rashaad Richardson attempts free throw versus LifeUniversity. Hoping to carry on the winning ways from last season, head coach Ron Hunter has the challenge of putting together a new team for 2012/13. “It’s different because we’ve got nine new faces in the program this year,” Hunter said. This team’s lack of experience does not change Hunter’s expectations. Hunter’s trust on the team is so high that he even decided to start two freshmen – R.J. Hunter and Markus Crider. Despite his full trust on the two freshmen, it’s impossible for the Panther coach to remain calm. “That makes me nervous- I’m having sleepless nights right now. But they’re very, very special freshmen,” Hunter said. Hunter has yet to familiarize with the new team, since last year, the squad consisted mainly out of seniors. However, he plans to rely on strong defensive play just like last year, even though he foresees the offense to be a little more effective. One of the biggest additions to the team is redshirt junior Manny Atkins, a transfer from Virginia Tech. Atkins, a 6’7 forward from Tucker High School, shot 91 percent from the free throw line and 44 percent from the field in limited minutes during his sophomore season. Coach Hunter believes that Atkins is ready for leadership role this upcoming season. It will be tough sledding for a team with five returning starters, let alone nine new faces. The Panthers face four teams within the top 100 of rating percentage index, a statistic that measures a team by strength of schedule by wins and losses. Georgia State beat Drexel last year, which sat at No.64. Yet, Duke is a tougher rival, sitting at No. 7 in RPI, though its reputation goes past numbers. Beating Duke would be a huge accomplishment for the team. Also, they haven’t been to the NCAA tournament since 2001, over three coaches ago, and their chances are especially murky this year as the team transitions to the Sun Belt Conference, rendering them ineligible for conference play. However, Hunter is still optimistic about the team’s chances. They’ll have support. 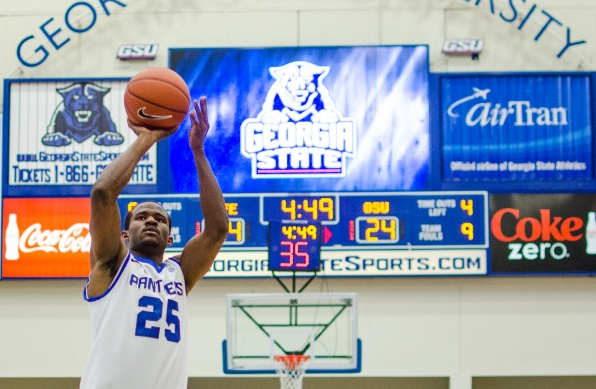 Georgia State men’s basketball tickets are flying off the shelf, and at the season’s first exhibition game, the home side was flush with student supporters. The Panthers travel to Duke for the Blue Devils’ season opener on Nov. 9.